You’re a reporter at a local TV station. An idea emerges at an editorial meeting, and the eyes around the table turn to you. “We have you in mind for this,” you hear them say. You like fun. You much prefer it to the mayhem that fills out much of local news. You’re a team player. You smile and salute. And as you return to your desk, you ask yourself: What the fizzle am I gonna do with this? One such stroke of genius sends you to Manuel’s Tavern, a renowned Atlanta watering hole. You’re sent to stalk a film crew shooting Anchorman 2. Your boss is somewhat obsessed with Georgia’s emerging filmmaking industry, no doubt reflecting a similar fascination held by the audience, whose American dollars sustain your advertising / ratings-supported news operation. You arrive at Manuel’s to see production equipment in a parking lot, but no crowds of spectators, no actors standing around waiting to be interviewed by the local news, no invitations to get close to the action. Your assignment looks to be a bust. You’re having a “make it work” moment. 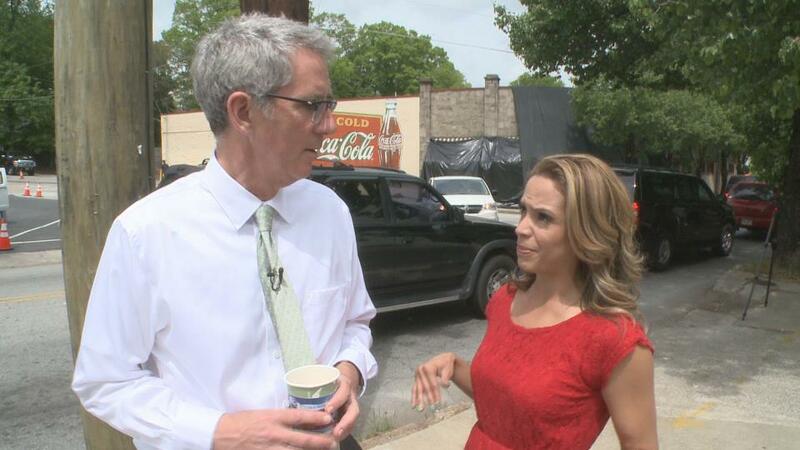 In this instance, the TV station has given you two valuable resources: An agreeable photographer in the person of Steven Boissy, and an even more agreeable co-talent in the person of 11 Alive’s Elle Duncan, who loves this assignment much more than you do. You alter your approach. You decide to produce the piece documentary style, a first-person “here’s us trying to cobble together a story with almost no elements” approach. You try to do stream-of-consciousness narration on scene, woven amongst bits of on-camera schtick. Thanks largely to Duncan, the story is watchable, somewhat amusing, and accurately reflects what happened outside Manuel’s that day. You become a victim of your own success. Another opportunity emerges from another editorial meeting. 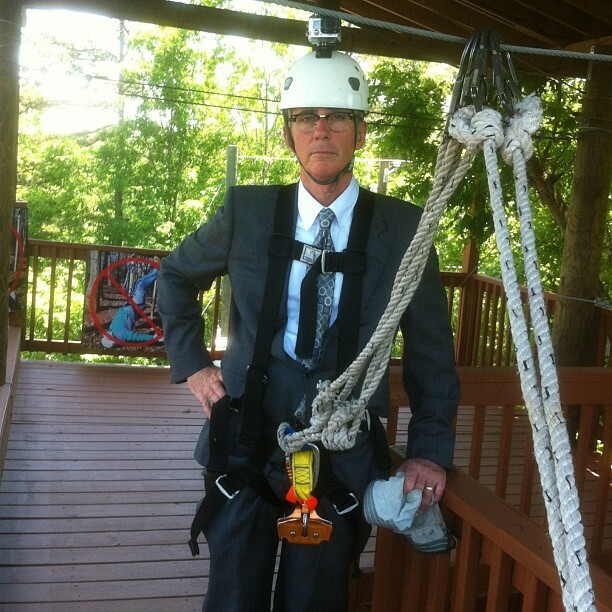 This time, the boss is intrigued by a Youtube video shot in Whitesburg, Ga. It shows a man leaping from a 100 foot bungee platform with a basketball, and sinking a shot in a standard 10-foot-high hoop. The agreeable Al Ashe pilots a vehicle to Whitesburg. Because you are cowardly, you conclude there’s no way in hell you’re jumping from a hundred foot platform to try to replicate the shot. But there are zip lines available. You’ve decided to do the piece documentary style, again. Trace bits of on-scene narrative, flavored with schtick, will tell the story of a Youtube video shot days earlier in the same location. You interview a guy who eyewitnessed the Youtube shot. He has placed a basketball goal near the end of a zip line. You’ve made a comedic decision to keep your suit on as he straps you on, then hands you a basketball. You squirt out of a tower on a zip line, holding a basketball, wearing a Go-pro. You spend the first half of the ride trying to manage holding the zip line and the basketball at the same time. As the hoop comes into sight, you figure it out. You hoist the ball with one hand, hurl it toward the hoop, and watch it clank off the rim. Yet the story is watchable, somewhat amusing, and accurately reflects the story, which wouldn’t have been much of a story without your heroic effort. “The story isn’t about you,” you hear your readers saying. And they’re right. This entry was posted in WXIA on May 21, 2013 by live apt fire. who is WWE? really dog.